One of my early hobbies as a kid was collecting baseball cards. At every card show, I was on the lookout for the 1989 Ken Griffey Jr Rookie card, #1, from Topps. My collecting craze lasted until the baseball strike in 1994. Then I lost interest in professional baseball and its collectibles. You’re asking, what does this have to do with electronics? 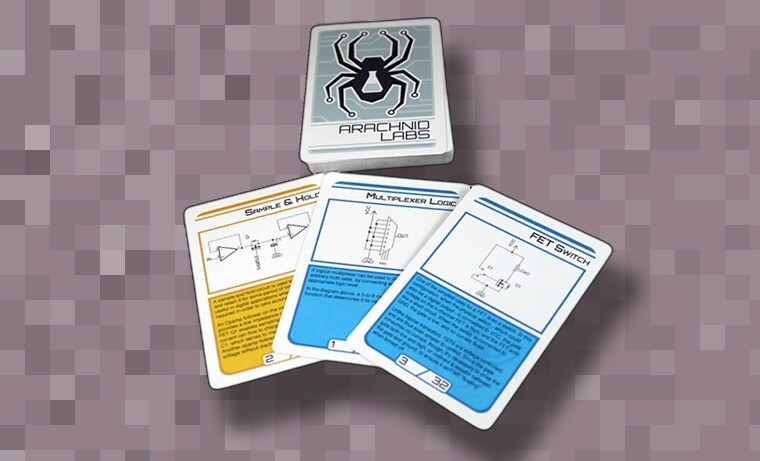 Well, the Circuit Trading Cards from Arachnid Labs reminds me of the days I spent trading baseball cards. Instead of memorizing RBIs and Homerun counts, these circuit patterns trading cards teach you circuit basics. The card stock used is of high quality, and each unique card has a durable feel. One side is the Arachnid Labs logo while the other is what I call the “information side.” The information side is one of three colors: Yellow (Analog), Blue (Digital), and Green (Power). Each card has a well-drawn schematic and some text description the circuit. For the most part, the circuits are big enough to be legible. The description, however, tends to be a bit on the small side. Also, the darker colored backgrounds make the small letters a bit difficult to read sometimes. There 32 cards individually numbered. They are divided into three groups: Analog, Digital, and Power. The analog cards have circuit elements like a sample and hold filter (#2). Two others that caught my attention were the RC low-pass filter (#14), and an emitter follower (#10). If your introduction to electronics was an Arduino or you haven’t taken formal education yet, this section is going to be the most valuable. 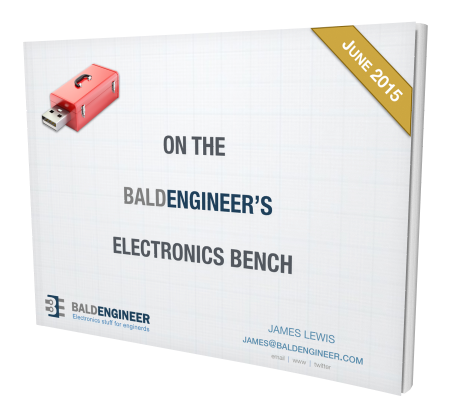 Understanding these analog circuits can make a world of difference in circuit design. Various regulators dominate this section. Two examples that stand out to me are for switching type regulators. The simplified boost (#21) and buck (#4) regulator circuits show you how a switching regulator works. They also help to explain the difference between switching and linear regulators. The LED Current Limiting Resistor (#24) is an example of the font being too small. The description is readable, but the equation for calculating the resistor is illegible–and my eyes aren’t that bad. For me, the circuit patterns most familiar section was digital. Most of my engineering career has been with digital systems. There are a couple of switch circuits, like the NPN Switch (#31), which are useful for hooking up hardware to a microcontroller output. Another card and explanation I like is on Open-Collector Logic (#8). This configuration was the first transistor circuit where I finally understood how transistors worked electrically. Even though the printing is a bit on the small side, there are too many good things about these cards to score it any less than 5 out of 5 LEDs. Arachnid Labs sells them through their Tindie store. You can pick up a full deck of the Circuit Trading Cards for $14.95 USD. For quantities of 10 or more, it looks like there are discounts available. Nice Idea, but can you recommend a reading list to match the areas they cover. I have a cursory knowledge of circuits and I’m looking for a bit of “light” reading for my holiday. The Art of Electronics is one of the best references. The clear simple writing is “light”. The book, however, is not. And they have yet to make a proper eBook version. (2nd Edition was a scanned PDF of the printed book.) I’ll even go to its index, before a google search because it is written so well. Hi James. I bought the “Bible” (the new, 3rd Edition) from Amazon in the UK. The book was a bargain, still in it’s shrink wrap so it had obviously never been opened. Thanks for the recommendation, good advice and info as always. Cheers! Yikes! Thanks for the heads up. Hi James, I’ve got those trading cards on my wishlist but I’ve yet to get anyone to buy them for me. Perhaps I’ll just have to sneak an order in myself. They are well worth the money. I did, however, get mine as a gift… I keep an Adafruit wish list going year round and send to my family durning the Holidays. This made it through.